Los Angeles is a hot place and the sun can be dangerous, but LA has a puzzling aversion to shade. Find out why with Jane Houlihan, Emily Green, James Rojas and Lorcan O’Herlihy. Also, Christopher Hawthorne and Coralie Garandeau discuss Eli Broad’s latest project and why the French find him fascinating. And Michael Sylvester has the highlights at Dwell On Design. For all its sunny days, Los Angeles doesn't do shade very well. Jane Houlihan of the Environmental Working Group talks about safe sunscreens and how often one needs to reapply. Emily Green, writer of the Dry Garden column at the Los Angeles Times explains why local school campuses are so barren and how LA's sunny ways may be a cultural issue. Urban planner James Rojas believes that LA used to be full of trees, but as people started driving cars, the dedication to shade faded away. He thinks trees should be part of LA's transportation system. 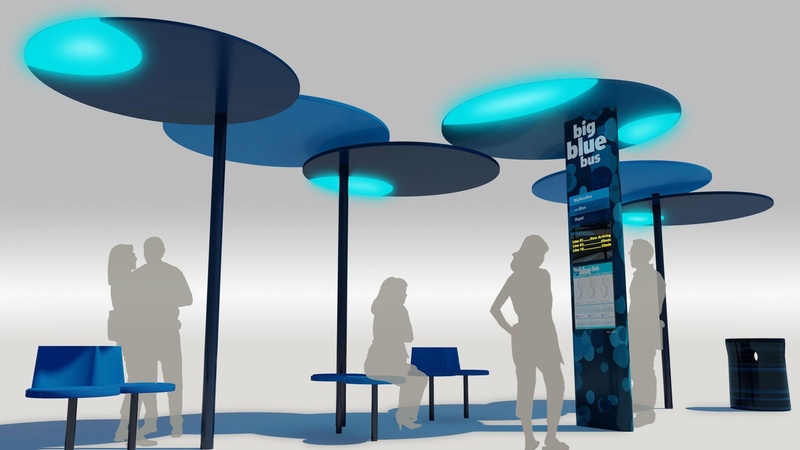 Architect Lorcan O'Herlihy was able to make the connection between shade and transportation for a new plan for Santa Monica Big Blue Bus, with bus stops featuring large blue disks positioned to protect riders from the sun. It has been reported that the art collector and philanthropist Eli Broad is leaning towards a downtown site for his new museum, and that architects Diller, Scofidio + Renfro are being strongly considered as architects, from a private competition that included Rem Koolhaas/OMA, SANAA, Herzog and de Meuron, Christian de Portzamparc, and Foreign Office Architects. Los Angeles Times architecture critic Christopher Hawthorne talks about Diller Scofidio + Renfro, a New York-based firm known for their work on the High Line and Lincoln Center. You can read more in his column about what the decision would mean to LA. French television correspondent Coralie Garandeau reveals details about Broad's past and why the French find his current plan to makeover Los Angeles fascinating. Brand manager Michael Sylvester talks about the speakers, exhibition, home tours for next weekend's Dwell on Design conference organized by the magazine Dwell, which is celebrating its 10th anniversary this year. KCRW Good Food host Evan Kleiman will be hosting an entire Sunday of panels focused around design and food. The conference is June 25-27, Frances will be speaking on Saturday and also will be reading at the Saturday evening event named City Listening, so check the DnA blog for more details and special discounts for DnA listeners.